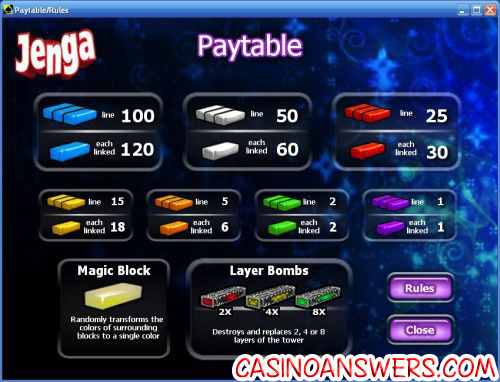 Jenga Casual Slot Guide & Review - Casino Answers! Jenga is an 18-line casual game slot developed by Cryptologic, featuring free games and other special features. 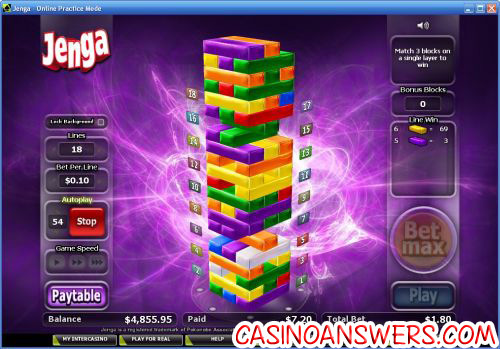 You can play the Jenga casual game video slot at Cryptologic online casinos such as InterCasino and Casino Joy. Jenga is a game made up of 54 wooden blocks that form a tower. In the game, you must take a block from the tower and put it on top. Whichever player causes the Jenga tower to fall is the loser. Playing the Jenga casual slot is very easy. The slot is made up of 18 paylines. You have the choice of playing the bottom 9 paylines or all 18 paylines. You can then place your bet per line of $0.05, $0.10, $0.15, $0.20, $0.25, $0.50, $0.75, $1 and every denomination of one dollar up to $20. The smallest bet you can make on the Jenga slot machine is $0.45, while the highest bet possible is $360 per game. Hit the “Play” button to play or use “Bet Max” to play all 18 lines. Payouts on the Jenga unique slot game are vary depending on the colour of the block and whether the blocks are linked to a matching layer. The payouts are as follows (single line/linked payouts in parenthesis): Purple (1), Green (2), Orange (5/6), Yellow (15/18), Red (25/30), Grey (50/60) and Blue (100/120). There are also special blocks in the game that you should look out for. The Magic Block will change all of the surrounding blocks into one colour. Layer Bombs will destroy and replace 2, 4 or 8 layers of the tower. These special blocks can help you get some extra wins on the Jenga online slot game at InterCasino! Payouts are made according to the Paytable. Payline wins occur when matching three blocks on a payline. Payline wins are augmented by matching blocks that are adjacent to or linked to the winning combination. Wins are multiplied by the amount bet per line. Maximum payout per game round is 50,000 coins. A Bonus Block is awarded for each block in a winning combination. Bonus blocks are added to the top of the tower, replacing randomly removed original blocks. The Tower Collapse feature triggers a free game round. Magic Blocks transform the colour of the surrounding blocks to match. Layer Bombers remove the full layers from the tower and replace them with new blocks on the top. Jenga features an autoplay mode where you can set the number of games (up to 999) and stop conditions, including: win threshold (up to $300,000), cumulative win (up to $300,000), cumulative loss (up to $300,000) and stop after tower collapse. Jenga is definitely a unique video slot that you have to see for yourself to know if you’re going to like it. It’s definitely a fresh change from spinning reels, which we welcome every so often. If you’re looking for an online casino to play the Jenga casual slot at, you can get a 100% up to $225 signup bonus when you make your first deposit at InterCasino! Where can I find more games like Jenga? We have reviewed the other games in the Cryptologic Casual Game Slot series. For more on these games, please read our Bejeweled Casual Slot Game Review and Cubis Slot Game Review. Is the Jenga video slot a US-friendly casino game? Unfortunately, USA players are not able to play at Cryptologic online casinos for real money. For an alternative, American players might want to check out the interactive video slots (or iSlots) at Rockbet Casino. Is there a Jenga flash game available for Macintosh users? If you’re a Mac player or don’t wish to download the casino software, InterCasino has an Instant Play casino available for you. If you can’t get it to work, try installing the latest version of Adobe Flash Player. Is there a Jenga casino game? Where can I find a unique slot machine?